Who doesn't love hummingbirds? 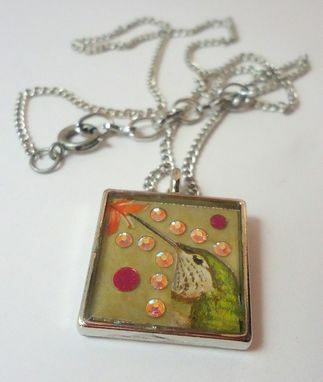 This fun and elegant little necklace features a collaged green hummingbird feeding on a flower, surrounded with crystals, and sealed forever with resin in a silver square bezel. The 1" x 1" pendant is suspended on a silver adjustable chain measuring from 20" to 21 3/4" with a spring ring clasp. 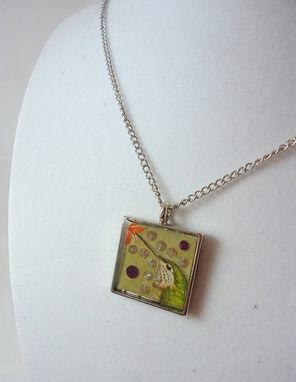 Small bubbles and imperfections within the resin is part of the handmade nature of this necklace and makes it unique and one of a kind. 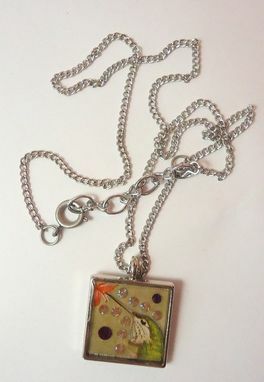 This is just 1 necklace in a series of 5. Please see my other listings for the other designs.